Yesterday, as I was minding my own business minding other people's business in Kino, I received an invitation to a private convo from someone I didn't know. Because I believe in building relationships instead of barriers, I always accept such requests. 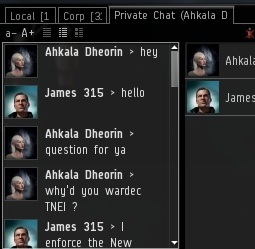 I was immediately asked for an explanation for my wardec of TNEI. This was an interesting question for two reasons. 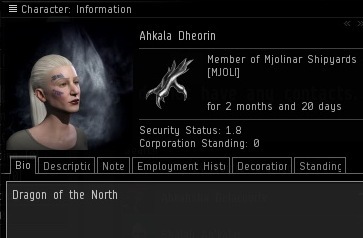 First of all, I am a proud member of an NPC corp and am therefore incapable of declaring wars. Second, I had never heard of TNEI. 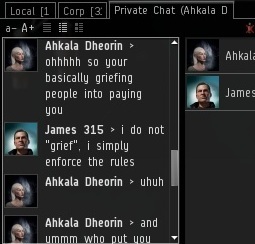 Apparently they are a relatively small group of highsec industrialists. 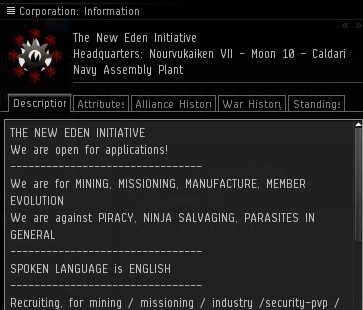 There were some red flags in their corp description: They are against piracy, ninja salvaging, and "parasites". I realized someone must have wardecced these industrialists on my behalf after witnessing a failure to abide by the Code. So I explained the New Halaima Code of Conduct. The diplomat assured me that the corp would never agree to follow the Code due to the mining fee provision, and she tested the waters with a thinly-veiled threat. Clearly I was not going to be able to negotiate an end to this war, particularly since it wasn't mine. I looked up the info on the wardec and found that it had been launched by a group loyal to the New Order, our old friends in Isinokka. 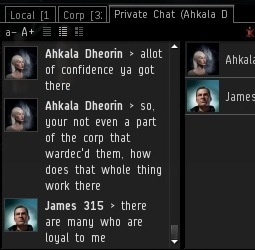 Finally, the diplomat got around to asking me how I was running a war from outside the wardeccing corp.
AS it turns out, our negotiations were doomed from the start. 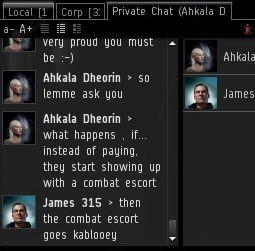 Not only was I not in the wardeccing corp, the diplomat wasn't in the corp that got wardecced. So much for the peace process.